This ride is very different from any other ride on this website in that the only way of using this trail is by making a reservation for a spot on a guided ride. The ride enters lands in the Peninsula Watershed that are under the control of the San Francisco Public Utilities Commission, in the hills along the western side of the San Andreas and Crystal Springs reservoirs, which are not open to the public except for guided hikes and guided bike and horse rides. Refer to the "Park Website" link on your left for information and to make a reservation. Rides are scheduled here fairly regularly, though I seem to remember that they have an off season during the winter. (I could be wrong.) The rides appear to be always scheduled on weekends, but the frequency of the rides seems to have fluctuated over the years. I remember seeing their reservation page with a ride on every weekend a few years ago, and even rides on both days of some weekends. However, another quick look through their schedule as I write this reveals bike rides only once every three weeks. (My guess is that this might be due to the availability and schedule of the volunteer docent more than anything else.) Typically, 9 or 10 spaces are made available for each ride. The only thing that can be ridden by these guided rides is Fifield-Cahill Ridge Trail, which is a single trail stretching from Highway 92 to Sweeney Ridge. I seem to remember the availability of guided rides that started from either end of the trail on the reservation page, but that has not been the case in recent years. (Perhaps I may have confused it with the availability of guided hikes from either end, which is still true.) At the time I write this, guided rides appear to start exclusively from the Highway 92 end of the trail (what the reservation page calls "Cemetery Gate"), and the ride you see on this page is one such ride. Long-time users of this website may remember that I originally featured a ride that started from the Sneath Lane end of the trail on this page, which is how most guided rides were done when I first tried them in 2009. Although that version of the ride no longer seems to represents what's currently being done, I've kept it available as an alternate that you can see here. Incidentally, I don't believe they ever schedule a ride to traverse the entire length of the trail (which is about 10 miles, one way, if I'm not mistaken). The "guide" for each ride is a volunteer docent, as far as I've seen, and their role doesn't go beyond accompanying you, showing the way, deciding where to turn around, taking head counts to make sure that everyone who came in also goes out, and answering any questions that they can for the curious ones in the group. Other than that, it's like any formal group ride where, for better or worse, the pace is set by the slowest riders in the group. When starting from the southern end of the trail as this route does, the meeting place is not actually Cemetery Gate itself. As you will see on the PDF map, Cemetery Gate is technically a trailhead that is located at the end of what Google Maps labels as "Cahill Ridge Road", roughly two miles in from Route 92. Possibly because it might be tricky and confusing to find your way there through the meandering roads in Skylawn Cemetery and continuing onto an unpaved road that looks barely used, the docent for my ride had given all participants instructions to meet at a wide gravel clearing adjacent to the entrance of Skylawn Cemetery on Route 92 instead. We then drove together to the trailhead in a convoy once everyone had shown up. I expect this to be the established practice still, but I don't know that for a fact. Fifield-Cahill Ridge Trail heads northwest from the Cemetery Gate trailhead in a rough approximation of a straight line and the ride on this page (just like all guided rides from this trailhead) is an out-and-back traversal of part of this trail. 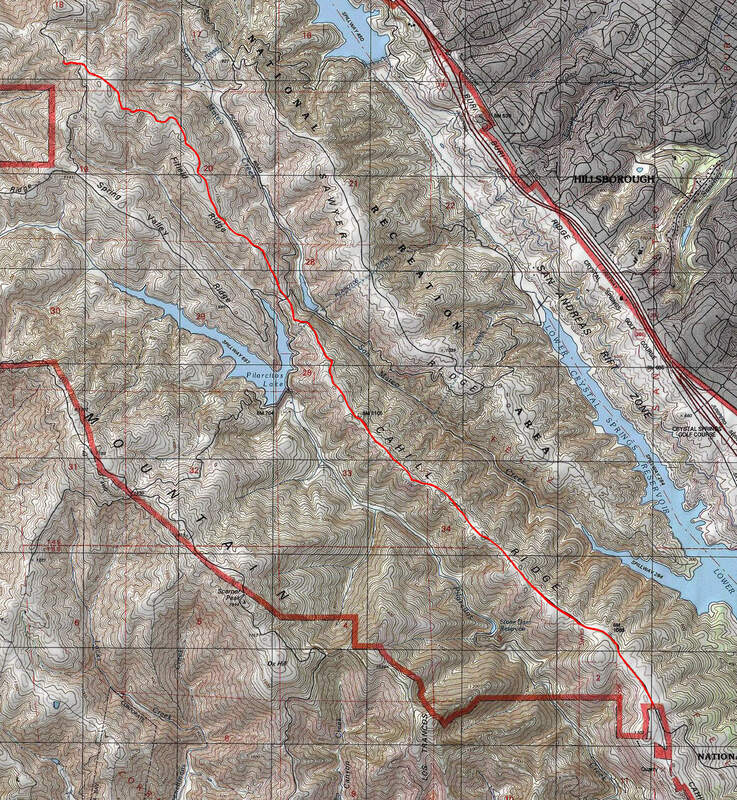 This overall straightness of the route is at least partially due to the general tendency to straightness of most geographical features in this area because of the location's closeness to the very straight San Andreas Fault. Fifield Ridge and Cahill Ridge, whose spines this trail follows, are two such roughly straight geographical features. Fifield and Cahill Ridges connect to each other at a fairly low saddle point where there is a junction labeled as "Five Points" on the trail map. The climb out of this low junction is the only significant physical challenge on this ride, though you'll get to face that challenge twice since this is an out-and-back. On your climb out of Five Points in the first half of the ride, the first half mile of the climb is the tough part. There is a 0.2-mile stretch in that half mile where the grade averages nearly 13%. It then backs off pretty quickly, so that you don't encounter any slopes with a grade that reaches even 10% until further up Fifield Ridge. During your return traversal of the route, there is a similarly short but tough section on your way out of the same junction that is just a touch shorter than the one in the other direction and very slightly gentler at about a 12.5% average grade. The rest of the trail southeast of Five Points is roughly flat on average with very moderate and short ups and downs, while the part northwest is more of a sustained climb on your way to the turn-around point of the ride, but the slopes are reasonable. That portion shows only three points that exceed 10% grade in my GPS data. Fifield Ridge and Cahill Ridge are like opposites in more than just their average slopes. While Cahill Ridge passes through a healthy and moderately dense forest of tall trees, Fifield Ridge features trees only in small clumps along the trail itself and is otherwised flanked by nothing but chaparral and open views. While you initially look only upon the surrounding ridges and Montara Mountain from Fifield Ridge, you start catching glimpses toward South San Francisco and Mount Bruno as you get higher, and toward the ocean and Pacifica as you approach the turn-around point for the ride (though I missed the latter on the day I did this ride due to some marine fog). My understanding about the turn-around point for the ride is that it is subject to alteration according to the needs and capabilities of the participants of the ride. However, I got the impression from the docent who accompanied us that the spot where you see this particular route turning back (which is at what looks like a "traffic circle" in the trail, close to a restroom) is the one they usually don't exceed. So, you could take that to mean that you shouldn't expect your Fifield-Cahill ride to be much longer than what you see on this page, though it might be a little bit shorter depending on who's riding with you.